This morning, Richard Branson’s spaceship startup Virgin Galactic unveiled the second design of its suborbital vehicles, SpaceShipTwo and White Knight Two. I am blogging this from the press conference at the Museum of Natural History in New York City. SpaceShipTwo is what the passengers will actually ride in, and White Knight Two is the launch vehicle that carries it to a high altitude before releasing the rocket. (It takes less energy to launch from 50,000 feet than from the ground). The design is a little bit different than the initial SpaceShipOne and White Knight One. Both are all carbon-composite vehicles, and are designed with an open architecture so that in the future other companies can use it as a foundation to create space vehicles for unmanned missions. White Knight Two is a double-hulled launch plane with four engines from Pratt & Whitney. One day we might be able to use space for energy production. While I believe aviation has to get more carbon efficient, seemingly benign industries like IT have outpaced aviation in carbon output. [One promise of a commercial space industry is] the ability to launch low-earth satellites that could literally take some of the heat out of the planet, by serving as a repository for information technology. Although the flight rate will be low to start, the vehicle is designed to handle high flight rates several years from now. “The spaceship is being designed so that it can be flown twice a day and the launch plane can be flown three times a day,” says designer Burt Rutan of Scaled Composites. 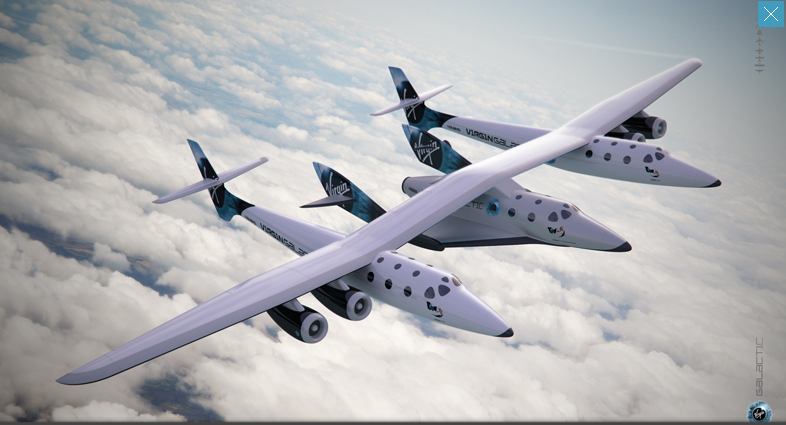 Virgin Galactic has ordered five spaceships from Scaled Composites, with an option of seven more. Rutan predicts that if Virgin Galactic is able to build 40 to 45 spaceships over first twelve years, with 15 launch planes, they could fly 100,000 people in the first twelve years of operation. Virgin Galactic hopes to begin test flights this summer, but no mention of when commercial flights will actually start. With recession fears in the air, you’ve got to wonder what kind of impact that might have on demand for such premium-luxury travel. And you thought Web 2.0 startups were risky. Within five years of launching, we hope that price will come down dramatically. We accept that $200,00, even though the dollar is not worth much anymore, is still too expensive for the majority of people. By comparison, a trans-Atlantic flight in 1939 between New York and England cost the equivalent of $47,000 in today’s dollars. That was one-way and coach.